The current flows in the Box Canyon are 1250cfs. Flows will remain at this level for the next few weeks as the Island Park reservoir is 93% of capacity. We still have great snow pack in the higher elevation so my bet is that it will be closer to the end of May before the flows come down. Water temps in the box are still a bit cold and we have not seen much in the way of hatches as of yet in Last Chance but I would expect to start seeing caddis up here if the weather holds. If you’re planning a day in the box I would bring the usual. A #10 black rubber legs and some small bead heads. I would make sure you had #14 and #16 tungsten electric caddis nymphs in your arsenal. If you plan on walking into the box a can of bear spray is a good idea this time of the year. The lower river continues to fish very well. The Mother’s Day caddis continues to hatch in great numbers and there are plenty of targets to cast to. Flows will continue to fluctuate as the weather warms but don’t let that scare you off the river. Focus your efforts on the banks. There are plenty of fish right on the banks eating caddis. We are also starting to see March Brown mayflies in good numbers. A few adult salmon flies have been spotted in the Warm River this week so I can’t imagine the hatch on the Henry’s Fork is to far behind! Two or three weeks possibly. It’s always hard to predict when the big bugs will arrive. As far as your fly selection I would have caddis in all stages of the life cycle. I have had great success with Mike Lawson’s #16 Olive Caddis Emerger as well as a 16 Spent Partridge Caddis. I would also have some #16 Hemingway Caddis with you. A #16 Olive E-Z Caddis is also a good choice. For The March Browns I have done well with a #12 Parachute Adams. If you are not seeing rising fish a #16 Brown Zebra and a #8 black or brown Rubberlegs Nymph will get the job done. It’s truly a great time to be on the water. Spring is my favorite time of the year on the Henry’s Fork. 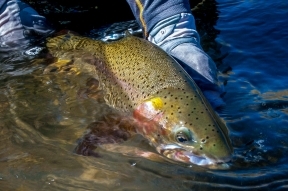 I can’t imagine anything better than watching large wild fish up eating dry flies! Looks like the water has come back up on the South Fork. 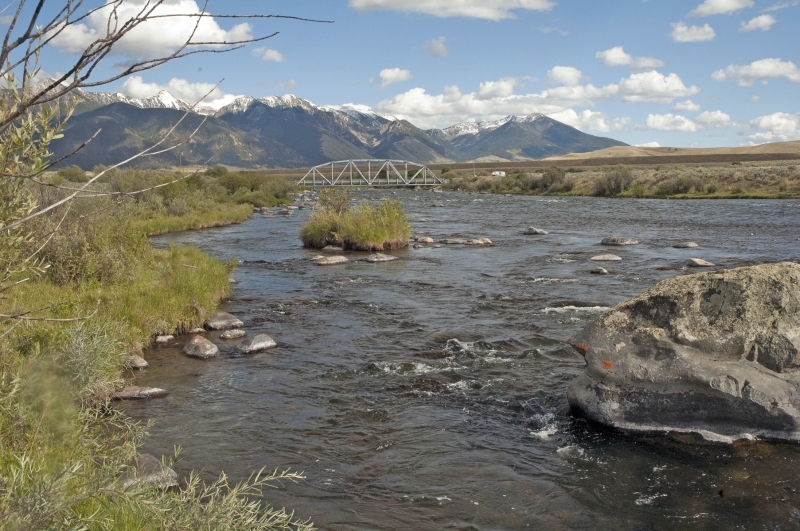 The current flows are at 18,500cfs. Again I would remind everyone that the South Fork is a dangerous river at 10,000cfs so being on the river at 18,000cfs is asking for trouble. 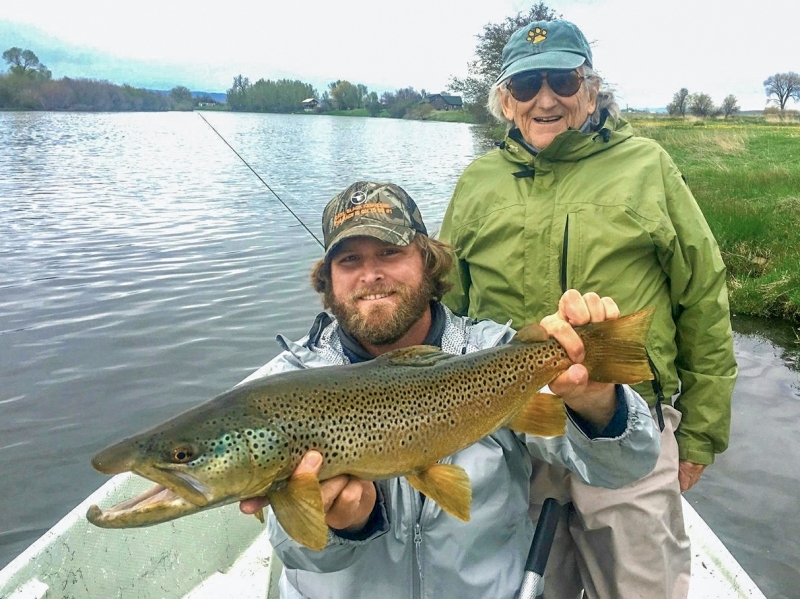 There are plenty of options for fishing in east Idaho right now. The walk wade section is probably your best bet for the Madison. Another good option is the stretch between Hebgen Lake and Quake but it has been a bit crowded. The river is currently 1900 cfs. Melting snow from the West Fork has put color in the river and fishing from the west fork down has become tough. In the walk wade section the blue wings are coming off in good numbers and the fishing has been great. I would have smaller chubby’s #10 purple and #10 green with you, there are still some Skwalas around. I would also have the usual small bead heads. #16 Cocktail Nymphs is hard to beat on the Madison. Also some #16 no-hackles are a good idea when you see the blue wings.